While reading book #1 (Slammed), I found out that there was more! A second book, already published and waiting to pick me up off of the floor, after I finished this one. The author happily sent it my way and it totally made my day (even though my day was already made)! Just knowing that my “Will and Lake” journey wasn’t over yet, absolutely thrilled me!! 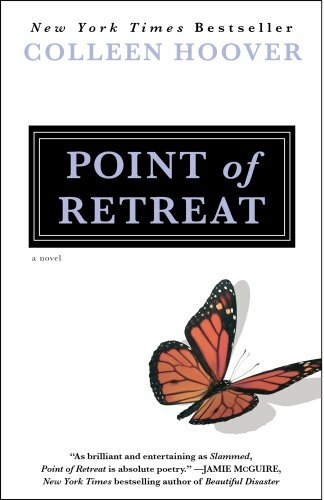 And while Point of Retreat didn’t make me sob like a baby, it still gets a solid 4.5 stars from me. Slammed got 5 because it managed to turn me into an emotional wreck. This one made an admirable attempt, and *almost* did. And while book #1 is my favorite of the two (the romantic tension and impossible situation was like a punch to the gut), many thought book #2 to be the best. Kimberly B: … I am half way through the second book and like this one even more. I thought that would be impossible, but no. Chris: Girls….Im really liking book 2. I mean *squeeing* like. Book 1 was so emotional for me but book 2 is more a love story. I love the “stars”……I wish I had stars to open. Yep. It was a HUGE hit with all of us. Fantastic, story progression, sweet characters, each having an important role in this “family” (because that is truly the feel of it… family). Sure not in the traditional sense, but they came together through hardship and tragedy, and as the two main characters forged on, friends and neighbors became an integral part of their lives. So without giving anything away…Okay, that’s gonna be a little hard to do, at least in terms of book #1 – so for all of you who haven’t read book #1… LOOK AWAY!! Believe me. You are going to want to experience Slammed in all of it’s surprising, and emotional glory so go get it now. And really… when I think about it, anyone who’s read Slammed SURELY has moved on to this book, because, how could you not? After that whole shebang, there is no way any of us could resist the follow through, so really? Do I need to tell you what #2 is about? Now that Will and Layken are in similar situations, and considering the depth of what they had to overcome, their bond seems almost unbreakable. They have both faced the recent and tragic loss of their parents, Will assisting Lake with the passing of her own mother (and also mourning her in the process). Both find themselves in the unusual role of guardian/parent to their younger siblings. And both have to continue growing up themselves, facing a future that, while seemingly scary, has a certain amount of security as they have each other. Each other, their siblings, and their newfound friendships that surround them with love and a sense of normalcy. What’s there to question? They completely understand each other, because of what they share, things seem settled in their routine, in their futures etc. But what happens when an ex-girlfriend shows back up in the picture? What happens when their obvious bond is suddenly put into question. Are they truly in love, or have they bonded together, forged their life together simply because of their circumstances. Is this a case of a bond forged in tragedy? Had none of these circumstances occurred, would they have ever pursued a life together? But that’s not all. Nope. Other stuff happens. I’m not going to say what it is. Maryse’s Book Blog: LOVE THAT!! The stars, the way they interacted together even despite the issues, the kids, the cute little customs… I adored them. I think reading this book while I was on a biz trip helped keep me happy and enjoying my weekend despite having to work, BUT because I was moving around so much, may have affected my ability to cry. Because as I think back to Point of Retreat, I NOW am feeling exceptionally emotional about it. Yep! See, I knew it! Just know, had I read this one late at night, me cozy in my bed, consuming this in one shot (as I did book #1), I have a feeling I would have had another *sob* moment. Unfortunately, I was too much in hurry to read this book (I couldn’t get enough after Slammed), and instead of waiting to savor it when I had a non-stop run of hours to devote to it, I read it on a biz trip. Too many starts and stops for me to cry, but I recommend you hole yourself up in a nice cozy atmosphere, put a DO NOT DISTURB sign on your door, and let loose. Wait for it! These books are a little slice of heaven when devoured in an undisturbed sanctuary. *hug* I am honored to have my very own star. I adore it!! You blogged it and i read them before you did…what?! I LOVED both books so much! I cried like a blubbering idiot too! My husband thought I’d lost my mind! Thank you for the heads up and thank Colleen Hoover for Slamming us all! GAH!! I loved both books too!! Have you all seen the poet perform The Lake for Colleen?? So awesome to see it come to life!! this book got to me so bad. I was in a similar situation as Lake. But i didn’t find a relationship, i found my bestfriend. BUT this book was just amazing, i was crying right through both books. Solid 5! for both books. I REALLY want this one, but I’m broke. Does anyone here lend kindle books?? Both these books were both solid 5’s. Great great great reads. Couldn’t put them down. Thank you, thank you, thank you! I loved both of these books. You have the best recommendations. Wow, thanks! But, I actually ended up with *just* enough money left on my debit card after paying bills, so I’m going to go ahead and buy it! I loved these books! I laughed out loud so many times, and I’m not one to laugh at just anything. Colleen is amazing at being able to connect the reader to her characters so it feels like we are part of this crazy, unique family. Please write a third book for the series. Pretty please? What next…I am so itching..I do not have a kindle so I have to wait for “bared’s” sequel to go to print as well as Marriage trap…thats horrible. YES!! Colleen is amazing with making her reader feel every emotion, and react. LOVE that! Patty have you read Beautiful Disaster yet? That is out in stores right now and is one of my all time favorites. Yup, it too was amazing…. I got that off your list as well…….also Marriage Bargain , Easy, Bared to you and The Siren…….I am also waiting for thoughtless and effortless to go to paperback……. When you mention BDB books what is that…stupid question?….. I like any love story from “50” to Beautiful disaster..can you recommend any other that pull at all your emotions…that is out on paper…. Your Blog is an amazing resource, I cant thank you enough for your reviews. I cried all the way through this book! I loved every bit of it. It totally moved me. What a great way for a way to have a mothers love live on after her death.